Ten months ago I was sitting in my university library. I was supposed to be studying for a final, but instead was pondering barefoot running. I had heard it mentioned on reddit, but didn't think much good or bad about it. For some reason the thought popped into my mind. I started doing some research and found Barefoot Ken Bob, Barefoot Ted, the book Born To Run , and many other related links. In that pile of awesome barefootedness Barefoot Running University stuck out. I don't know what it was about the Barefoot Running University that intrigued me, but I couldn't stop reading. The information was laid out so nicely in an easy-to-read format that I could relate to. In the corner of that page was a book written by the author of the site. It was the first edition of The Barefoot Running Book. I ordered it, said thanks to the author and read it within a week. Since then I have passed it on to other prospecting barefoot runners. When a new version of The Barefoot Running Book came out I contemplated needing it. The author, Jason Robillard, strongly promotes minimalism not only on feet, but in life. Was this a want or a need? Eh who cares I had to have it! I wrote Jason(we had communicated a few times since then) and asked him if I sent him money via Paypal if he would send me a signed copy. He quickly replied, asking me for my address. Within a few days The Barefoot Running Book, second edition , arrived at my doorstep free of charge, autographed, and with a nice note. You're a great ambassador for barefoot running. Keep up the good work! This version took me a little bit longer to read. I was bothered with my studies and had a few books in line before it. If you are skimming through this post and looking for a book review you can start reading here. 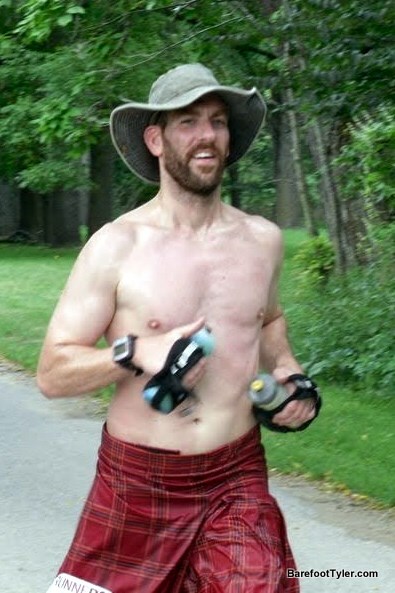 Jason Robillard has many years of barefoot running under his belt. He teaches through experience. If he finds something that works for him he informs the reader, even if the notions seem odd or unpopular. The book is written from a teacher-to-student point-of-view. Jason is a psychology teacher and the material covered in the book is best learned from a teacher-to-student perspective. This book fits right into the barefoot movement styled books out there. Compared to The Barefoot Book it gives less information on why barefooting is so great, but seems to provide more information on how to run barefoot, which is clearly the intention of the book. The Barefoot Running Book is geared toward a wide range of runners. From pure barefoot runners to even those shod that want to run correctly, the book fills in all the cracks. Jason writes in a formal, but laid back style. He seemed much more professional in this book and cracked less jokes than the previous edition. Is this a good thing? Eh... it depends on who you ask. Personally, I was expecting something clever in the section about injuries, but I guess if he is trying to appeal to a professional audience and get the point across that barefoot running is serious, then it is a good move on his part. The Barefoot Running book is easy to follow. It persuades, gives beginner to advance advice, includes a ton of well written testimonials, and finishes up with some of Jason's success stories. As far as flow, it couldn't be written better. Since reading this book I have only reinforced my perspective on barefoot running. Being similar to the first edition, the second edition makes me want to get out and run barefoot daily. It also encourages me to get out and be barefoot all the time. It is neat to see how my body reacts to conditions I didn't think it could possibly stand a few years ago. I would recommend this book to all barefoot runners, beginners to advanced. I feel like I have a handbook that answers all my questions. If for some reason I lost this book I would buy it again, just to have a great reference and support a great author. Of course if you don't believe my praises you can give it a glance yourself. Jason has the first fifty pages available on his website(click here to open the PDF). If you are interested in purchasing please use this Amazon link to do so or buy directly from Jason at Barefoot Running University. I got a few books I gotta read first but I am getting his book soon. Jason runs a great blog, I follow it regularly. I've only read Born to Run by McDougall and it was very informative. This book you've read also intrigues me. I'll buy one next week and I hope everything is as informative as Born to Run. Aside from these books. I also recommend reading Barefoot running versus Barefoot running shoes. You will definitely learn so many things from this books. Click on this link HERE to read the whole article. Happy New Year! Great post and review of Jason's book! I bought it as an ebook, which I think was the first edition. It was very well laid out and I enjoyed how we discussed how to gradually increase training in order to compete barefoot later. In Dr. Craig Richard's book, "The Complete Idiot's Guide to Barefoot Running" (Penguin / Alpha) due out at the end of this month, I believe he also outlines a slow plan so that runners can transition to handling trails, all sorts of terrain, and even racing. The book is reviewed more thoroughly at the running barefoot book page at Barefoot-Running.us but also available on Amazon and bookstores. Both of these books might make the best combo pack for beginning barefooters. Well done!